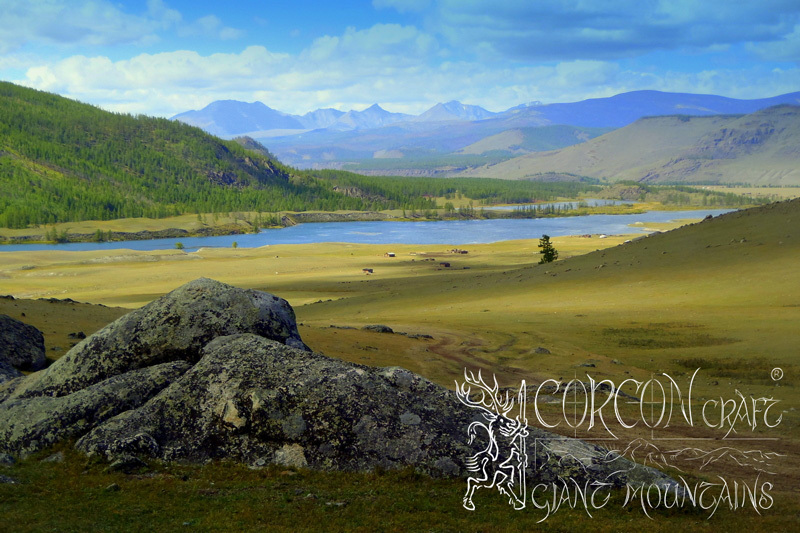 Taimen Tours - New Season 2014 - „MONGOLIAN SPRING"
After an adventurous spring season of the now passing fishing year 2013, with many exciting catches and a few wilderness explorations of our own, in order to discover untouched Taimen hunting grounds, we would like to introduce some new fishing tours to our valued clients and friends of Taimen fishing, which we have already prepared for the new spring season in 2014. 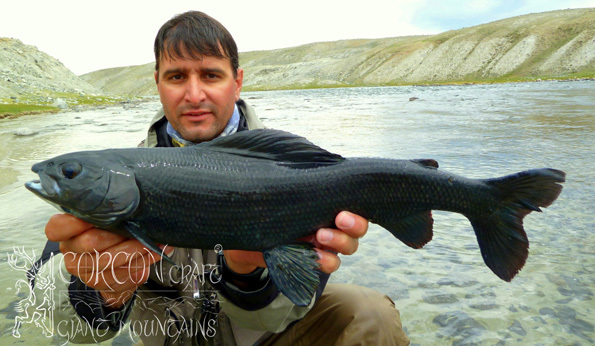 - From the avid grayling angler specialist, who can follow his passion from our comfortable log-cabin camps and well-equipped yurta ger-camps, and fish at the gates to the wilderness for 4 different grayling sub-species, for prehistoric Altai Osman, for fat Lenok Trout and for numerous Hucho Taimen. 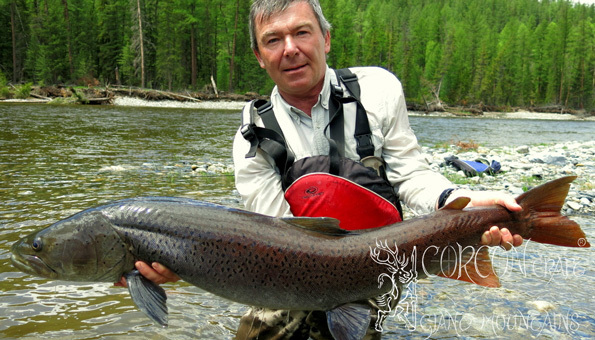 - Through the demanding Taimen angler, who will be chasing the largest of trophy-class specimen at remote rivers and in the tranquility of the Mongolian - Siberian Taiga, and still enjoy the comfort of our legendary and traditional wilderness camps. Few last Tours in the SPRING Fishing Season 2014 still available ! Traditionally built comfortable lodges and cabins with bath-room and warm showers, a stylish dining room with bar and 2-bed log-cabin accommodation with cozy wood-ovens and with service. 2 weeks of full board with fresh organic European cuisine and local traditional dishes. Camps are fully equipped with our 4-wheel-drives, horses, boats and camping gear for longer fishing explorations. Maintained trails along the rivers and log-cabins for camping at wild waters. - Breathtaking scenery and highland grandeur throughout the entire tour. Plenty of local culture, native traditions and free nomadic tribesmen and herders living nearby our wilderness camps. 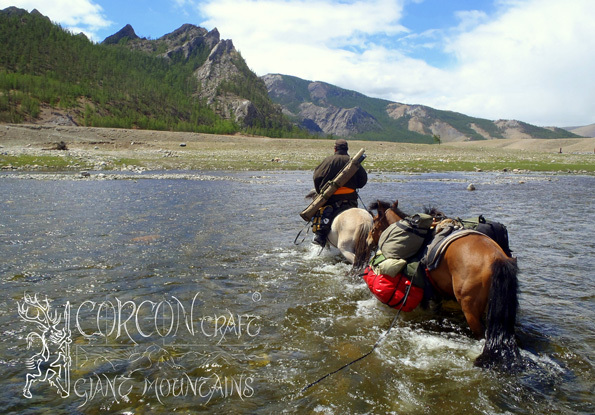 This year´s new offer, - outstanding and demanding 18 days expedition with horses, pack-reindeers, native carriers, tents and backpacks along the Siberian Border, downstream the wild river Shishkid, using our wilderness camp Chanagai as base camp. 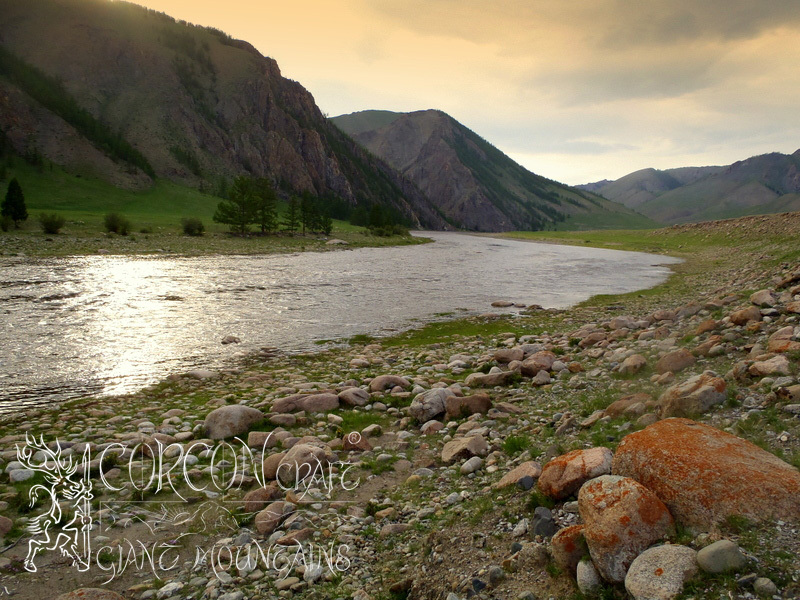 An 18 days expedition into one of the last and prime strongholds of the great Mongolian Taimen Huchen, perfectly unaccessable backcountry leading through steep canyons, along the river on hard treks, across moorlands and deep into the magical home of this long-living fish, the greatest salmonid on earth. 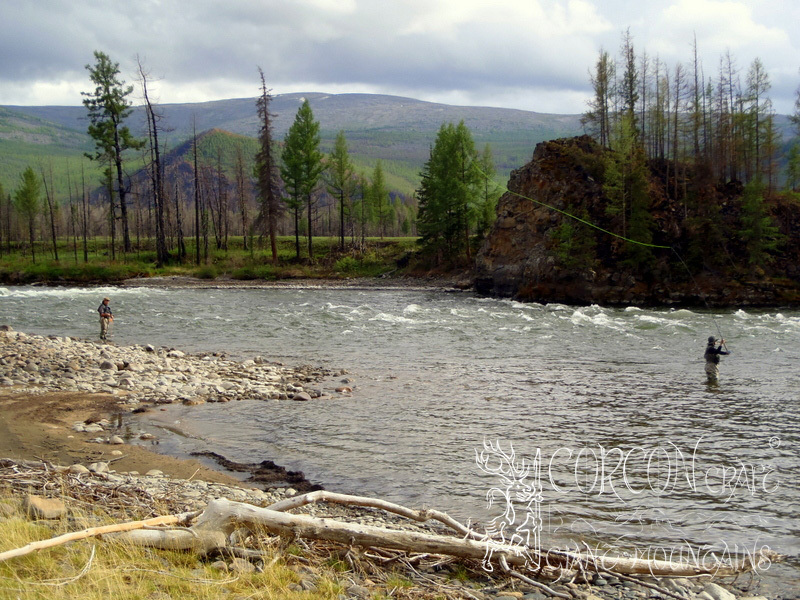 Headwaters of the mighty Siberian Yenissei River in the wild Eastern Sayan Mountains. 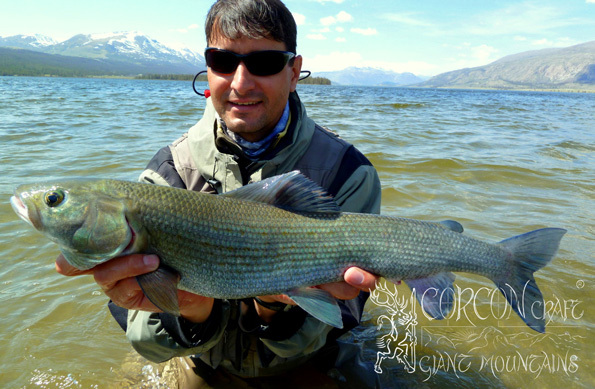 Initial spearhead explorations of our own in the past years, were producing unbelievable results, numerous of the largest Taimen specimen, which can be caught on rods and flies. Only 3 - 4 experienced and physically healthy and enduring sportsmen can take part at this tour. Exclusively for fly-fishermen by the strict use of single-hooks and on catch & release policy only. These precious adult fish are treated with respect and represent the most valuable and protected habitat of the Giant Taimen. Every sportsman, taking part at these demanding expeditions, may prove his physical ability by a medical approval of his personal domestic doctor. An additional, extended international travel, life and rescue insurance must be recommended to every participating client for such a very special fishing tour. All necessary local permitions and licenses will be arranged by us in the country for every single fisherman individually. 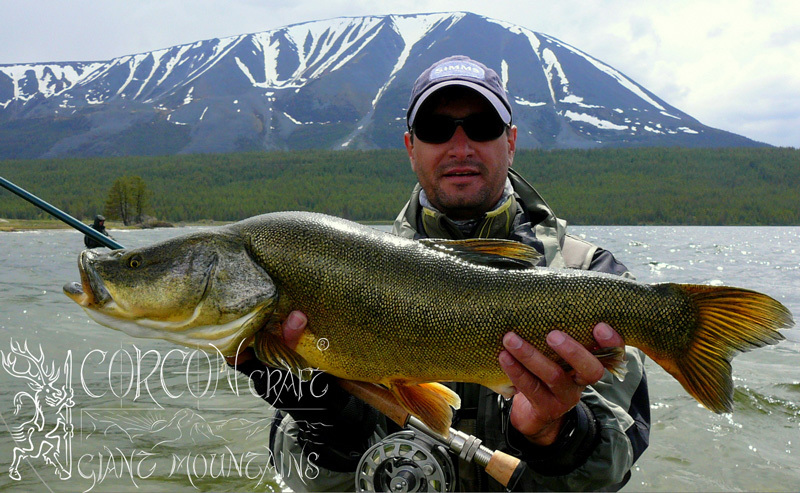 The Expert in Mongolia, specialized in sport fishing only, with more than 20 years of experience in the country and own office in Ulaan Baatar. 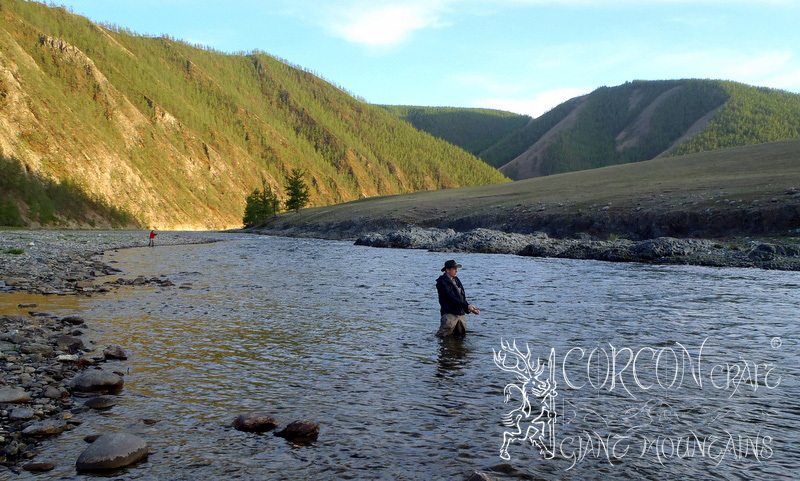 We are a well-established German, Czech and Mongolian based Fishing Outfitters Company, with a serious passion and target for large trophy-class Taimen for our sportsmen clients. - The genuine and raw fishing experience. Limited small parties of sportsmen, 4 - 6 rods only per camp. Lodges Tengis and Chanagai at the wild river Shishkid, our main log-cabin camps at the legendary rivers Tengis and Shargyn in the remote Darhat Basin, holding traditionally most of the great record-class fish. Perfect conditions for fly-fishing in June and early July, sensational hatches of large insects, pure mountain streams, hungry and aggressive fish in prime condition. 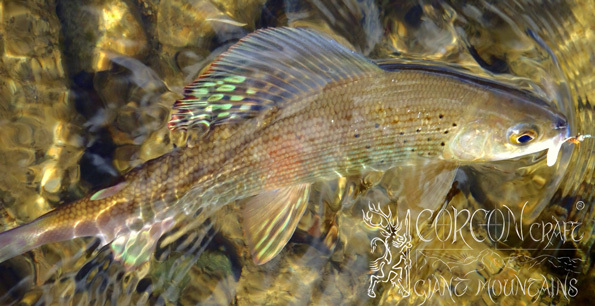 Precious Golden-Tailed Grayling on dry fly in crystal-clear and wild rivers. 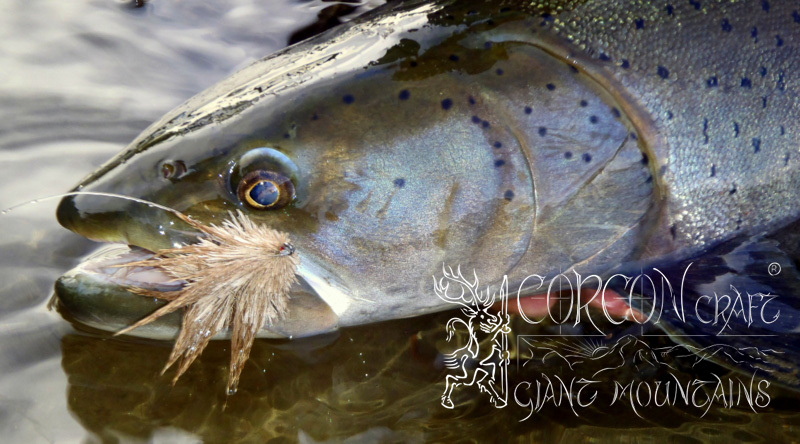 Barbless and solid single-hooks are mandatory, as all of our Giant Taimen are treated with respect, are carefully released and returned into the river. Only proven fishing tackle for this kind of fishing. Strong tippet-material 30 lbs + and fully-caged reels with reliable drags, possibly disc-drags, are required. 200 yards of 40 lbs backing is necessary for trophy-class Taimen. Strong rods, no lesser fly-rod than # 9/10-weight for big rivers should be considered for this kind of fishing with large and heavy flies, - better class # 12 for big Taimen ! Best are double-handed rods with a deep, powerful action for large rivers, preferably Skagit-Lines or Spey-Lines with a shorter belly and sink-tips. For fishing heavy Lenok Trout and strong Grayling in swift current, a long and smooth # 6/7-weight, 10 foot rod is a very good choice, while a strong 11 to 12 ft. Switch-rod in class # 7 is probably the best all-round fishing tool for the lesser game fish, for Trout and Grayling in Mongolia. Robust multi-layered clothing for cold climate in natural lighter colors. No fashionable jackets in black or red. A light, but best rain-jacket with membrane and thorn-proof, tough outer material. Breathable waders must be tough and well made, solid boots with ankle support and steel studs. Airy fishing shirts for freedom of movement and with large chest-pockets. Tough outdoor pants or shorts for the spring season. Walked-in leather boots for trekking along the river. A wide-rim and impregnated hat offers far more sun-screen and rain protection to the sportsman, than any modern baseball-cap. Warm wool beanie and neck panuelo-scarf for the fall season. 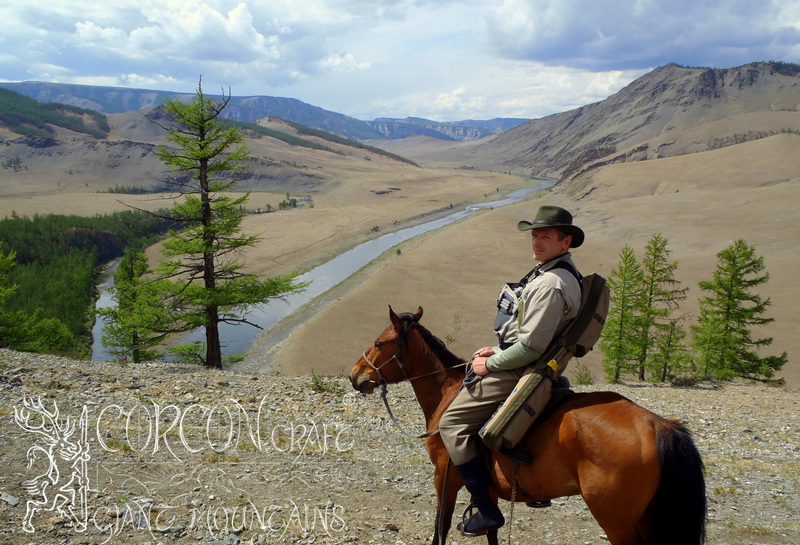 An inflatable life-vest and a solid wading staff with rubber-cap are simply common sense and must be carried at all times, while fishing with us at wild Mongolian rivers. Fishing & Tour Equipment in compact backpacks and rod-scabbards and waterproof bags for horseback, rafts and off-road vehicles. No hard suitcases. Inclusive domestic flight and transfer to the North-West, domestic hotel accommodations in the country and transport to camp, second domestic flight to the North, Mongolian fishing license and special Taimen permit, with full board 2 weeks at our camps, and with German guide Jan Haman - fluent in English, Spanish, Czech and Russian language, at Your service during Your entire tour as the local fly-fishing expert, interpreter, professional hunter, archer and nature-guide. Additional is the internat. Hotel in the capital Ulaan Baatar of the fisherman´s own choice and price-class at own bill. Reservation can be arranged by us from our office in town, prices for single room range from USD 75,- to 240,- per night. Deposit payment at booking 50 % no later than 31. 10. 2013 (for reservations of best flight-connections and for the limited Taimen permits) or until all dates and camps are reserved. Final payment 60 days before departure. Cancelling fee of 25 %, which will be replaced (by a 10 % credit) with booking for next season. Cancelled bookings of flights are usually not replaced anymore by most airline companies. A travel cancel-insurance is recommended. Weight limit of travel baggage is a max. of 40 lbs by the airlines today. The compact equipment in robust backpacks and rod-tubes should not exceed 40" inches in length for ease of handling.